Our family loves this recipe. The light coating of maple syrup provides a delicate sweetness against the zip of the ginger and garlic. It is a great weeknight meal as it is quick to prepare and oh so healthy. I have used a large salmon fillet and I have also used precut fillets to prepare this recipe. Both work equally well. Just be sure that your pieces are roughly the same size and if using a large salmon fillet, simply tuck the thinner tail end underneath to minimize overcooking of that area. The high content of omega-3 fatty acids is what makes salmon a nutrition power food. 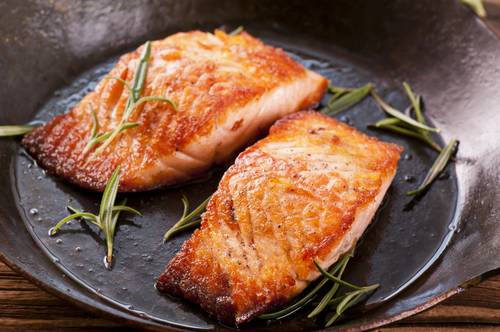 Salmon is low in saturated fat and calories but high in protein. Maple syrup adds a natural sweetness to this healthy salmon recipe. In a small bowl mix the maple syrup, soy sauce, garlic, orange juice, orange zest, salt & pepper. This step can be made ahead of time and kept in the refrigerator until ready to prepare dinner. Place the salmon in a large oven-proof baking dish or heavy pan, and coat with the maple syrup mixture. Spoon marinade over top to be sure all the salmon is covered. Cover and marinate in the refrigerator for 20-30 minutes. Place the uncovered baking dish in the preheated oven and bake for about 25 minutes or until the fish flakes easily when tested with the tip of a knife. Garnish with fresh rosemary and serve immediately.